Two of golfs top young guns, Jordan Speith and Justin Thomas are earning their place on the leader boards. Speith emerged on the pro scene in 2013 and was a force to be reckon. He became the youngest player to compete in the Masters in 85 years in the year 2014 and then went on to become the second youngest person to in the Masters in 2015 while also tying the lowest Masters score (-18) set by Tiger Woods in 1997. To date, he has 14 professional wins, 11 of which are from the PGA Tour. In 2017 he won the Travelers Championship but hit a rough patch in 2018, having no wins. Justin Thomas turned pro the same year but had a slower start than Spieth. In 2017, Thomas experienced a breakout year, winning four PGA Tour events, including the PGA Championship, his maiden major championship, and also winning the FedEx Cup championship. In May 2018, Thomas became the 21st player to top the Official World Golf Ranking. 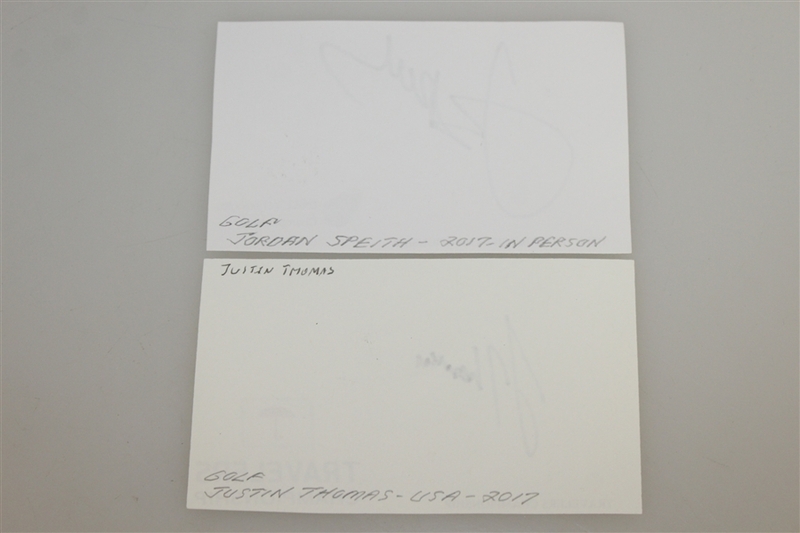 This lot features signatures from both of these world class golfers, Speith signing a Dell Technologies card and Thomas singing a Travelers Championship card.